Each unique target can have individual settings associated with it. There are three settings you can adjust that are permanently associated with a given target. You can change or remove them at any time later. Fleet is used to include specific targets as members of your "fleet". Fleet members might be friends or co-workers and whenever a fleet member is displayed on the plotting screen its icon has a small "F" inside it. 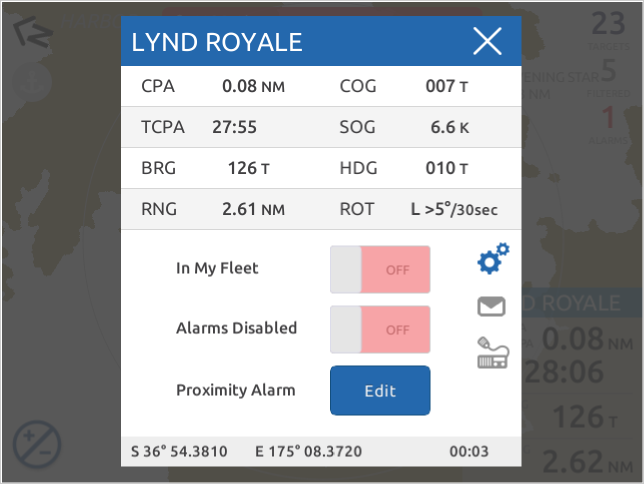 You can also alter a system-wide setting which controls if fleet members can be affected by filters. Disable Alarms is used to turn off all alarms for this particular target, even if it would otherwise trigger an alarm condition. Use this setting carefully, but it can be handy for targets that you know you never want to trigger an alarm. An example is a commonly encountered ferry or a co-worker's vessel that ordinarily operates closely. To adjust the target settings touch the gear icon. The lower half of the target details dialog will be replaced with an area showing the current settings for this target and allowing you to adjust them. When you are done, you can touch the gear icon again to resume display of the full vessel details. Changing your selection to another target also resumes display of the vessel details.